With the excitement of Christmas, New Year’s Eve tends to slip by without any fun plans. 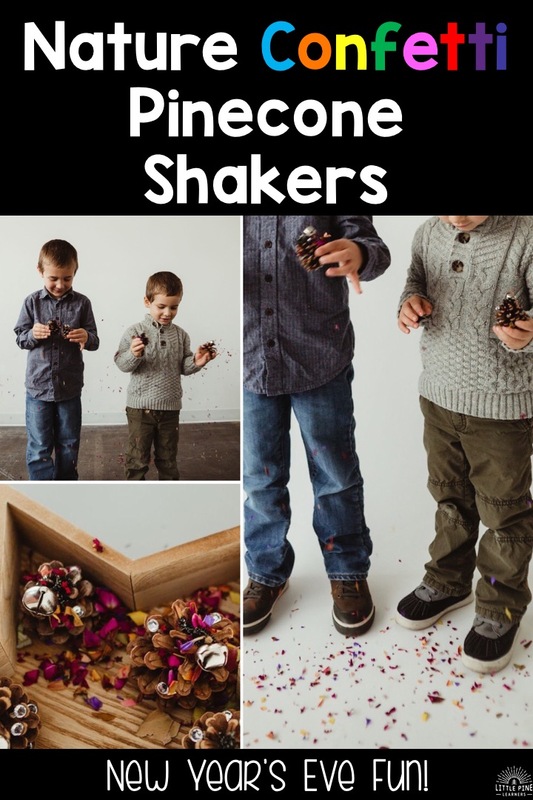 This year I’ve gotten a head start on planning a fun new tradition that includes a DIY New Year’s Eve nature confetti shaker and noisemaker all in one! I will also share why this nature confetti is not your typical nature confetti. 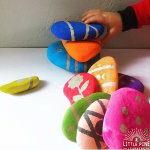 I hope these ideas find a special place in your heart and home for the holidays! First things first! I want to thank Melissa from Little x Little Photography for collaborating with me on this fun project and letting us test this idea in her gorgeous studio. I know you will enjoy her photos as much as I do! I first heard of the genius nature confetti idea from Mother Natured. Nature confetti is wonderful because it’s biodegradable and won’t harm the environment or animals. On the other hand, the confetti and glitter that most people use for celebrations is made up of tiny pieces of plastic. These little pieces can end up in landfills or waterways and is a known environmental hazard for the oceans. Needless to say, I am now sold on this gorgeous nature confetti idea! Our New Year’s Eve nature confetti is a little different from your typical nature confetti. In addition to the beautiful bouquet flowers we bought for the activity, I’ve been saving and pressing pieces of nature from special events throughout the year to add to the confetti. I added a couple wildflowers from memorable hikes, leaves from the first day of fall, and other special moments pressed in between the pages of books all over our house. I displayed these gorgeous pieces of nature on the table and we reminisced about those special times we’ve had together this past year. 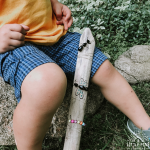 This little step made this activity a little extra special and meaningful. This step was a lot of fun! My boys had fun working on their fine motor skills by tearing, cutting, and punching pieces of nature for our confetti. We used a star paper puncher to punch flower petals and leaves. The paper punch is really fun to use and the stars made the confetti a bit more festive! 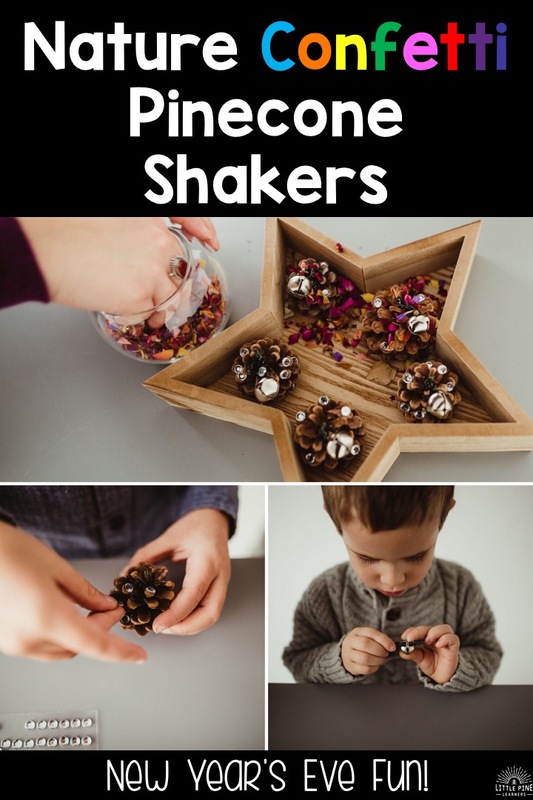 Who knew pinecones make a the perfect confetti shaker?! This idea randomly came to me one day and I was so excited to try it! First we added a little sparkle to the pinecone by adding gem stickers. 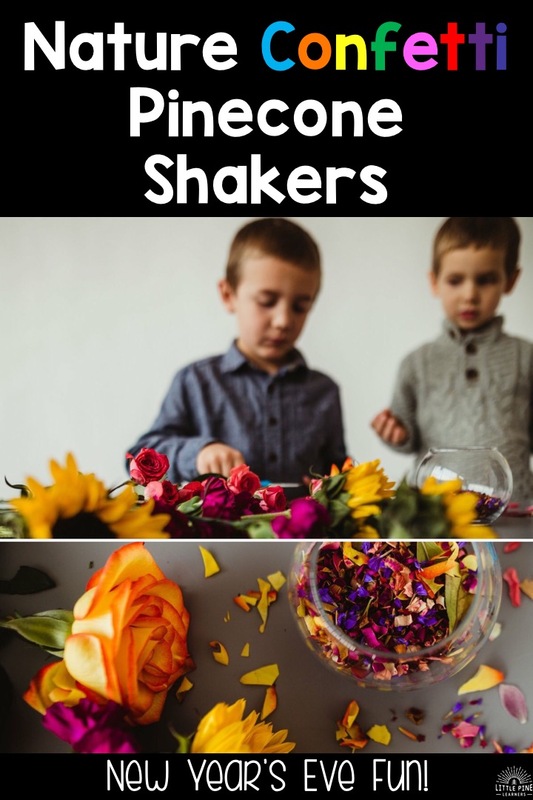 This step is totally optional, but we also use these shakers as holiday decorations, so the gems make them a little more seasonal and decorative. Plus they mimic the shimmery glitter when you shake it. We’ll be saving these for years to come! Next we added the bells. Leo threaded the bells with the pipe cleaners and I twisted them to the top of each pinecone. 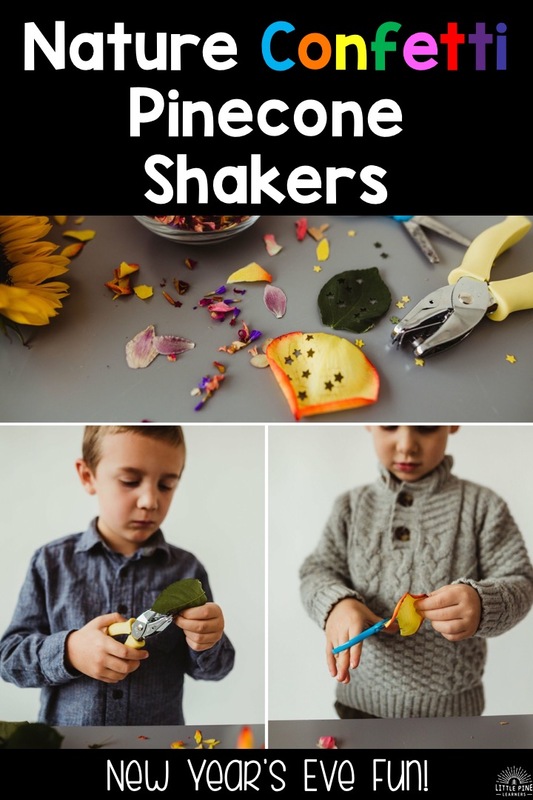 Now you have a nature confetti shaker and noise maker all in one! I put the pinecones in a star shaped container and I stuffed them full of confetti. Try to get a lot of confetti on the ridges! 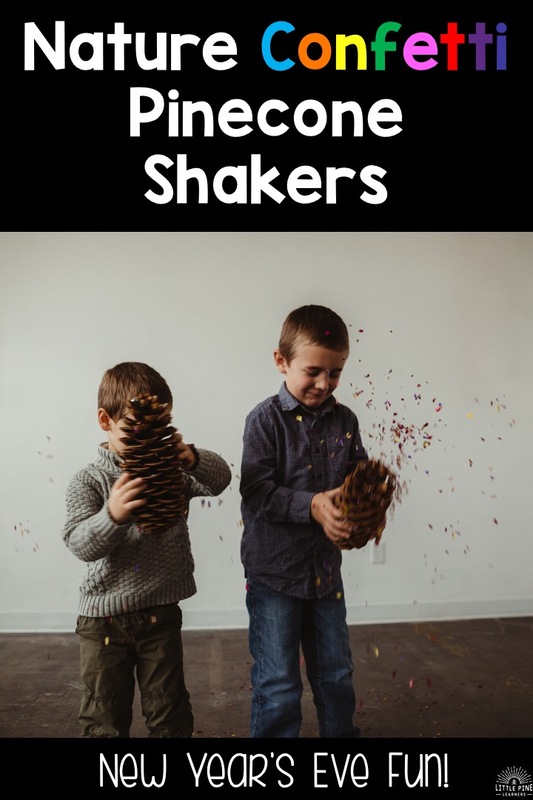 Step 4: Celebrate and Shake! We tested out both small and large pinecones. My boys grabbed one small pinecone in each hand and started shaking! The nature confetti flew around and they loved watching all the colors dance around them. Last we tried the large pinecones! They were really big but my boys were able to hold on to them with no problems. 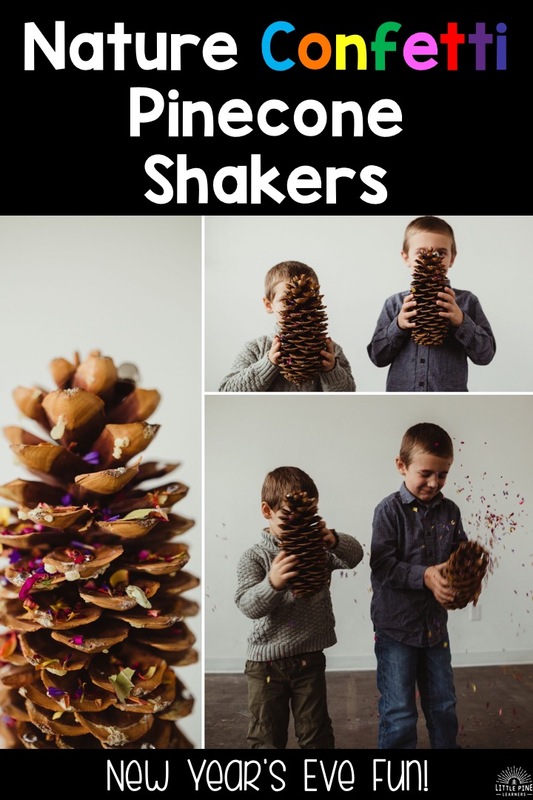 These pinecones can hold a lot of confetti and it was a lot of fun to watch the boys shake it all out! We can’t wait to try it again on New Year’s Eve! Don’t put away that bouquet of flowers just yet! 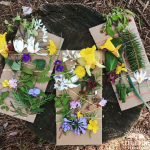 Check out A Simple and Beautiful Nature Craft to Try Today. Check out More of Melissa’s Stunning Photography Here!